Firstly, Juniper has a decent guide with important caveats for this technique located here. I've just added some additional colour which seems to be oft-requested. While the devices themselves support tcpdump, the tool is only able to capture traffic destined to and from the routing-engine and has no visibility into transit traffic. The tool that Juniper does provide us with is called datapath-debugging, and it does not produce an output that is readable by tcpdump/Wireshark by default (it requires conversion). In our example, I'll be attempting to record packets going to and from a problematic website. It's important to understand that the filters listed below are stateless and do not match in both directions. If you want to see traffic to and from a particular host, you will need to specify two separate packet-filter statements. In our case, the problematic website is located at 208.74.207.25. It may be necessary (due to volume) for you to specify the other end of the connection. It's also important to be aware of NAT in these situations as it can alter your filters. You'll now be presented with file(s) within /var/log with the name you specified in step 1. These will unfortunately not be useful to you immediately. Once converted, you'll now be able to view them with the tools of your choosing. This is one of the most common questions I see, both in my professional life as well as on popular Juniper technical forums. 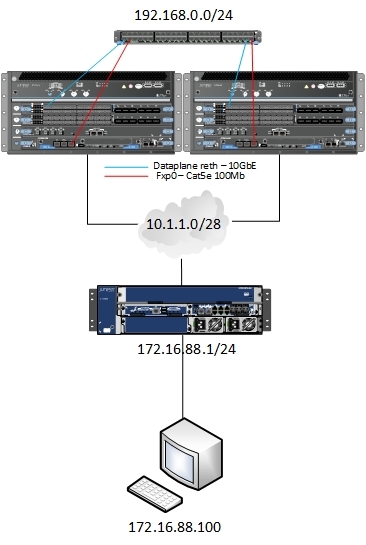 Most of this confusion could be avoided if Juniper allowed for fxp0 to be placed in a non-default routing instance, however, for the time being, we're left with having to perform the following (moving all interfaces to a VR instead of just fxp0). For those who are unaware, fxp0 represents a dedicated management interface to the routing-engine of the device. On the SRX, there is complete hardware separation between the routing-engine and the dataplane (which is responsible for the actual forwarding of transit traffic). This is accomplished on the high-end devices by a separate hardware module or blade (SRX 650 -> SRX 5800), and by dedicated CPU cores on the shared CPUs on the smaller branch devices. 1 Cluster of two SRX to be managed via fxp0 remotely. 1 Stand-Alone SRX acting as our VPN peer. Our SSH Proxy will reside behind this gateway. 1 SSH Proxy (172.16.88.100) for remote device management. This example assumes the cluster has already been configured, the VPN (route-based) is up and running, etc. If you are unfamiliar with these topics, you can check out previous articles here on how to set them up (or support.juniper.net for the official documentation). set interfaces reth0 unit 100 description "Outside interface"
set interfaces reth1 unit 0 description "Attached to Management VLAN for fxp0 access"
Step 3: Assign the correct routes to the default routing instance (that should only contain fxp0) so that it has a return path to our SSH Proxy regardless of what state it's in (RPD does not run on the standby node). This requires us to use several pieces of configuration. Step 6 (Optional): Ensure you can still SSH to the master device if the VPN tunnel goes down by adding SSH accessibility on the outside reth interface. Ensure this is locked down appropriately with firewall filters! Step 7 (Optional): If your cluster requires access to things like public DNS, NTP, or application-services updates (IPS/AppFW, etc), you'll need to add NAT and security policies for fxp0 to access the appropriate resources. IF-MAP, at its core, is a user identity propagation mechanism and protocol. Juniper's implementation allows you to attach 'roles' to a specific user, and create policies that permit or deny traffic based upon said role. In the case of the SRX, the firewall itself does not participate directly in the IF-MAP Federation; It relies on a proprietary communications channel over SSL (JUEP) to an Infranet Controller (IC) to request/receive user identity information. source-identity is a (but not the only - see UAC) policy match term you can use to leverage IF-MAP on the SRX. The term was introduced in 12.1, and relies on a 'first-packet-drop-lookup' mechanism to handle packets that match the policy. Basically, if a new connection matches a policy with source-identity as a match condition, the firewall will proceed to drop the packet and query the local IC for the user identity/role information of the source IP address, assuming there is not already an entry in it's local database. Depending on the response from the IC, the firewall will then match the user's role to the policy and permit the flow, or, if the user identity does not contain the required role for the policy in question, it will continue doing policy lookups until a terminal match is found further down in the rulebase. IE: These policies are not terminal. restrict-source-identity-lookup is a hidden feature/command within the 'unified-access-control' stanza that was added into the 12.1X44D30.4 release which is meant to significantly increase the performance of a device leveraging the source-identity feature. What this command does is quite simple; It makes any rule with source-identity terminal. If a flow matches a policy with source-identity while restrict-source-identity-lookup is configured and the user does not have the required role, the session will be denied. As such, it is generally adviseable to place these policies at or near the bottom of the rulebase to avoid issues with unauthenticated (server-to-server) traffic that may share similar source/destination/application information. To successfully use the feature in the rulebase however, the security policies themselves get quite a bit more complex. For every policy that utilizes source-identity matching, you must have a 'clone' policy (placed adjacently) that mirrors the match conditions, while using the source-identity of 'unauthenticated-user' AND 'application-services uac-policy'. The second policy with 'unauthenticated-user' is meant to catch an (you guessed it!) unauthenticated user from an unknown source IP and perform a 'first-packet-drop-lookup' to gather their information. Thus, once the source IP address is known, the flow will come back down through the rulebase and match the first source-identity policy with the required role, and either be permitted or outright denied, based on the received information.